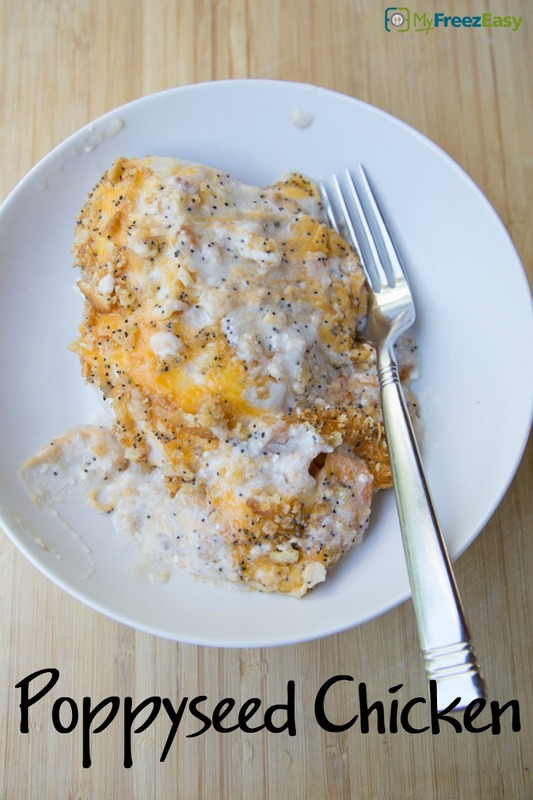 Your favorite Poppyseed Chicken recipe...made for the freezer. This is a layer of chicken, creamy “cream of soups” sauce, shredded cheese and buttery crushed crackers (with poppyseeds!) Because the shredded cheese acts as a ‘barrier’ between the creamy sauce and the crackers, you don’t have to worry about them getting soggy. Let this thaw, then bake covered and uncover for the last few minutes of baking. Everyone will love this amazing dish! Place the chicken breasts into the insert of the slow cooker. Season with salt and pepper. In a small mixing bowl, combine the cream of mushroom soup (undiluted) and the sour cream. Pour over top of the chicken and then top with the shredded cheese. In a small mixing bowl, toss together the crushed crackers, poppyseeds and butter. Place on top of the shredded cheese. Set the slow cooker on low and cook for 8 hours, or until chicken is cooked through. Cooking time may vary depending on thickness of the chicken. Serve Slow Cooker Poppyseed Chicken with rice and salad. Open 2 cans of cream of mushroom soup. Do not dilute with milk. In a small mixing bowl, combine the 2 cans of cream of mushroom soup with 2 cups of sour cream. 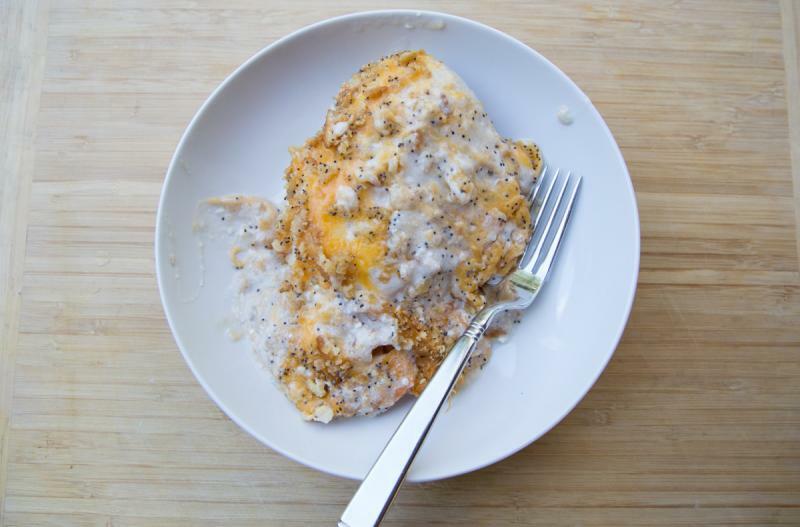 In a small mixing bowl, toss together 4 cups of crushed crackers, 2 tsp poppyseed and 8 Tbsp melted butter. Put baggie in the freezer and freeze up to 6 months in fridge freezer or 12 months in a deep freezer. Thaw in the fridge overnight, or a warm bowl of water for about 20 minutes, before transferring to the slow cooker and cooking as directed. Thaw and place in the slow cooker insert. Cook on low for 8 hours, or until chicken is cooked through.